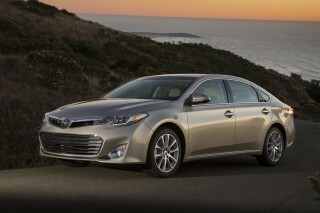 Want those advanced features like active cruise control and blind-spot warning? At least for now, you'll need to get the Luxury Package and all of its extras before you can get the Technology Package, which has those top-tech items. The 2014 Kia Cadenza is no sport sedan, but it's a screaming deal of a luxury car in nearly everything but the badge. South Korean automakers have made value a principal part of their appeal. But what happens when prices go up and those brands venture into luxury territory? 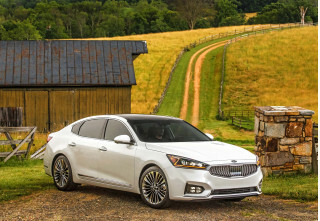 The 2014 Kia Cadenza will be the first test of the automaker's growing reputation, and its ability to draw buyers at the $40,000 price level. Yes, even before the Cadenza's introduction, the 2014 Kia Sorento could already stretch over the $40k mark, fully loaded; but it's the Cadenza that reaches beyond that, and really tests the brand's boundaries by expanding into a new part of the market: big sedans that some call 'near luxury'—cars that might not have a luxury badge, but be for all intents and purposes luxury cars. Kia couldn't have picked a better name, either, we think. In music, it's the colorful, skilled solo that usually helps bookend a concerto. Likewise, Kia sure has had a run the past several years, pushing beyond the bland-basic, car-of-last-resort flavor of cars like the Sephia and Spectra and onto models fashion-forward, truly desirable models like the latest Optima and Forte. And—ahem--there was a predecessor to the Cadenza, just a few years ago: the arthritis-inducing Amanti. Simply a great-looking large sedan, the Cadenza looks like a performance-focused model from some angles even though it isn't. As with all those newer Kia products designed under Peter Schreyer, the Cadenza hints throughout that it's European-influenced, but whether you take the design a piece as a time or as a whole, it's definitely not derivative. The Cadenza is closely related to the Hyundai Azera, but you'll never know it from the outside—or from the inside. To the point, they're completely different designs, and the Azera's smooth, flowing design and deeply sculpted sheetmetal stand in contrast to the Cadenza's taut, more athletic look. Overall, the Cadenza feels quick and responsive; but it's all relative and you really can't compare the Cadenza to any true sport sedan. Power is provided by a 3.3-liter V-6, making 293 horsepower and 255 pound-feet. The V-6 doesn't make all that much torque at the low end of the rev band, which means that stepping away from a standing start, or up a steep hill, feel a bit more sluggish than you'd guess from its power output—until the revs build, and then you rocket ahead. Steering lacks road feel and requires a lot of small movements to stay on course on the highway. When driven at anything but a sport-sedan pace, this is a car that feels confident on the back roads yet maneuverable in town. Choose a big sedan like the 2014 Kia Cadenza, that's not overtly a sport sedan, and you might expect the ride quality to be pillowy, almost queasy. As with many of the latest entries in this class, that's no longer the case; the Cadenza has top-notch interior comfort, without those boat-like old-fashioned big-car motions. It's also luxury-car quiet inside. Get the Luxury Package and you'll have ventilated front seats, heated rear seats, and even a driver's thigh extension—something rare in this class of cars and something that will be appreciated by tall drivers. In back, the available panoramic roof really limits headroom, though. 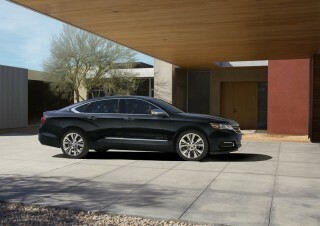 Once you're in, this is a sedan, that won't let you down on the subtle details. 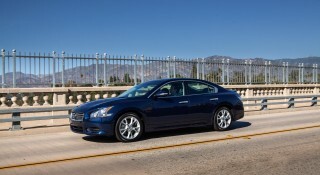 The Cadenza is a very quiet-riding sedan, with almost no wind noise, and very little road noise, at highway speeds. Materials, and the leather upholstery, are very impressive throughout the cabin. The Cadenza is one of the first models from Kia to get the new UVO eServices system, which provides integrated roadside assistance, diagnostics, and other services, through a paired smartphone (no separate subscription is required). It also has Kia's top eight-inch touch-screen system that responds well to natural voice commands and includes plenty of traditional physical buttons to back things up. Navigation is included as a standard feature, and it's one of the best systems on the market, with clear, colorful displays, live traffic, and easy-to-intuit split-screen views. Kia isn't actually calling the Cadenza a luxury sedan--just a 'premium' one. And it's in an in-between market niche that some shoppers might find just right. At $35,100, the 2014 Cadenza includes lots of standard equipment and is quite the value considering it's about the same price as a well-optioned Optima (SX Limited), Accord, or Camry. With the Luxury Package and the Technology Package added to that, you get things like a panoramic sunroof, power retractable sunshade, Nappa ventilated seats, a heated steering wheel, 19-inch alloys, smart cruise control, blind-spot detection, and lane departure warning—all for about $42k. Luxury badge or not, that's going to seem like a deal to a great many families and comfort-minded folks. The 2014 Kia Cadenza is a very handsome big sedan—and it looks like a sport sedan, even if it isn't. With great proportions, an athletic stance, and clean, uninterrupted sheetmetal, the 2014 Kia Cadenza looks like a sport sedan even though it isn't. As with all the latest Kia products designed under the direction of Peter Schreyer, the Cadenza hints throughout that it's European-influenced, but whether you take the design a piece as a time or as a whole, it's definitely not derivative. Inside, the look is rich and finely detailed, with soft-touch and nicely grained materials for the upper dash, plus woodgrains for the steering wheel and dash and door trim. Controls and displays are laid out in a cockpit style, with plenty of supplementary steering-wheel controls. Front and center on the dash, there's a mix of the traditional and the leading edge. An analog clock lets us know that this model is reaching up to the premium and luxury crowd, while Kia's latest eight-inch high-resolution touch-screen system sits just above it. Two rows of buttons are laid out below the screen—the upper one for climate, the lower for audio and navigation. Above, in some models, is a twin-panel panoramic roof setup; with its blacked-out panels, it helps punctuate the look from the outside, and it brings a lot more light into the cabin. The 2014 Kia Cadenza accelerates strongly and brakes confidently, but its steering and handling don't do anything to transcend the idea that this is a big sedan and that comfort comes first. Kia makes no grand claims for the Cadenza's performance; and for those wanting a big sedan that appeals mostly on value, comfort, and style, it's not going to disappoint. 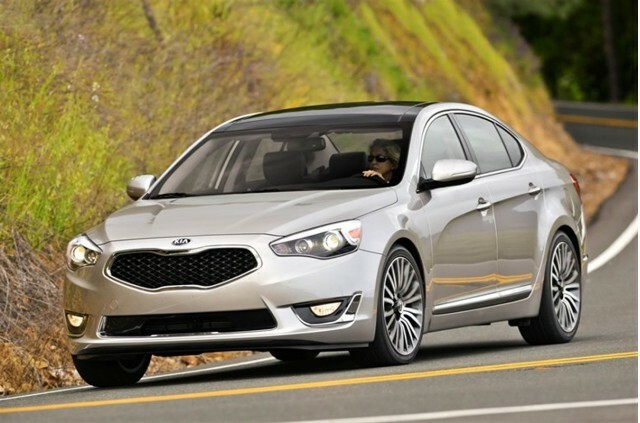 The 2014 Kia Cadenza is relatively quick and responsive for a car its size. That said, those who want something verging on a sport sedan are going to find that the Cadenza is missing some of the fine aesthetic nuance that can make a large, front-wheel-drive sedan rewarding to drive, and much of that is a matter of steering and handling. Power is provided by a 3.3-liter V-6, making 293 horsepower and 255 pound-feet. This new-generation, all-aluminum engine is direct-injected, with dual continuous variable valve timing, a timing chain, and three-stage variable induction. The Cadenza's V-6 doesn't make all that much torque at the low end of the rev band (Toyota's V-6 in the Avalon feels perkier that way), which means that stepping away from a standing start, or up a steep hill, feel a bit more sluggish than you'd guess from its power output—until the revs build, and then you rocket ahead. Meanwhile fifth and sixth gear are quite tall, so the transmission downshifts frequently on long highway grades, or when simply resuming the cruise control from small drops in speed. There's no sport mode for the powertrain or the stability control. There are however steering-wheel paddle-shifters, plus a manual gate, that let you manually command the gears. Push the Cadenza (about 3,800 pounds as we tested it) hard into a corner, and you'll realize quickly that this is no sport sedan; the body control is better than some other large sedans, but it has neither the steering feel nor the transition chops to satisfy enthusiasts. Whether in steering feel, body control, or general responsiveness, this is a car that feels athletic enough on the twisty sections, provided you're not truly expecting to extract the most out of curvy canyon roads or hustling on country back roads. Brakes feel surprisingly strong and confident, however. Steering feel is on the light side, and while it loads up enough off center to be helpful, there's very little, if any, feel of the road. It also requires more attention and small adjustments than it should at highway cruising speeds; although it adds up to great maneuverability at parking speeds. The Cadenza has a comfortable but not pillowy ride, as well as a smart, well-trimmed interior; rear-seat headroom with the panoramic roof is the only real disappointment. Choose a big sedan like the 2014 Kia Cadenza, that's not overtly a sport sedan, and you might expect the ride quality to be pillowy, almost queasy. As with many of the latest entries in this class, that's no longer the case; the Cadenza has top-notch interior comfort, without those boat-like old-fashioned big-car motions. It's also luxury-car quiet inside. And if you've owned German luxury sedans in the past, don't expect to be stepping down in comfort-related items. When optioned up with the Luxury Package, you'll find a driver's seat thigh extension (quite the improvement for taller drivers on longer highway trips) plus a heated steering wheel, ventilated front seats, and even heated rear seats. The seats themselves are on the soft side, and while some might prefer a little more firmness, particularly for their back, these there's lots of legroom, and the driving position should be great for a wide range of sizes. In back, too, there's enough legroom—even for long-legger riders over six feet tall, behind other six footers. Unfortunately, those tall riders won't be comfortable in back if you've opted for the two-panel panoramic sunroof system, which is included with the Luxury Package (mandatory for every other option, like the Tech Package and its smart cruise control and other active safety). You'll need to duck a bit when getting in, because of the downward-sloping roofline. But the real surprise comes inside, where you lose what we estimate to be several inches of headroom to the back housing of the roof system. There are two scooped-out areas in the headliner for outboard riders, but you'll need to hunch forward. The other thing is that if you're on a curvy road, hold on; the front seats are quite soft, and they provide zero lateral support, really, and if you're going around tight corners. The Cadenza is a very quiet-riding sedan, with almost no wind noise, and very little road noise, at highway speeds—all with good aerodynamics, a tight structure, and smart application of noise-blanketing, rather than stopgap measures like active noise cancellation. Materials are very impressive throughout the cabin. The ventilated Nappa leather seats that are included with the Luxury Package are as soft and supple as you'll find in $60k luxury rides. Just as in other Kia models, there's no shortage of real physical buttons here—something we like, actually, and between decent voice control, those hard buttons, and the touch screen, there's a good level of redundancy that allows you to truly do it your own way. There's value here for those concerned about safety; the 2014 Kia Cadenza offers all the luxury features you'll find in luxury cars costing much more. The 2014 Kia Cadenza hits all the marks for safety, and with its 'single-spec' presentation, it's easy to wrap in a few innovative active-safety options. The Cadenza comes with eight standard airbags, including front and rear seat-mounted side bags and full-length side-curtain bags. A rear camera system and backup warning sensors are included, too. An advanced smart cruise control system offers four different following distances and will actually brake the car to a stop for traffic ahead, while the lane-departure warning system may help alert you if you're drowsy or inattentive (it chimes loudly); meanwhile, the blind spot detection system helps warn of vehicles that are to the side and just behind. 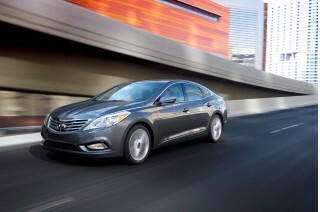 The Cadenza has earned top 'good' scores from the Insurance Institute for Highway Safety (IIHS) in all categories. 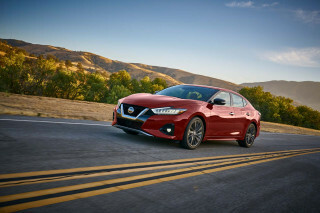 It's a Top Safety Pick for 2013 in its 2014 model-year launch edition, but it hasn't been crash-tested for small-overlap strength--the IIHS' new requirement for its highest awards. The National Highway Traffic Safety Administration (NHTSA) hasn't tested it at all. We'll update this section as the ratings are released. 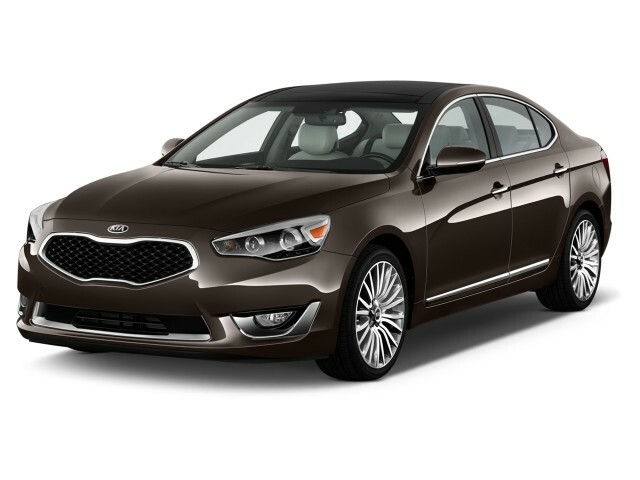 If you're motivated by in-vehicle technology and luxury features, you can get it all here in the 2014 Kia Cadenza, at a price that's really competitive. You won't find any stripped-down base model of the 2014 Kia Cadenza. Unlike Kia's other models, which are sold in trim levels such as LX, EX, and SX, the Cadenza is sold only in a single 'Premium' trim. That means even if you don't opt for one of the two major packages, you're getting a big sedan that's loaded with luxury. Factory-installed options are limited to the Luxury Package ($3,000), the Technology Package ($3,000), and a White Interior Package (price not yet available). Considering the base price of $35,100 (and $800 destination), with both of those packages added you get a vehicle with top-tier luxury features, including things like active cruise control and blind-spot monitoring, for less than $42k. With the Luxury Package you get a panoramic sunroof, power retractable sunshade, active front lighting system, Nappa leather seats, a ventilated driver's seat, heated rear outboard seats, a heated steering wheel, a power-adjustable steering column, two-position seat and mirror memory, a driver's thigh cushion extension, a first-aid kit, and a seven-inch TFT gauge cluster. Add the Technology Package and it steps up to 19-inch alloy wheels, hydrophobic front-door glass, an electronic parking brake, smart cruise control, blind-spot detection, and lane departure warning. The navigation system runs off an SD card, and the system is included in all Cadenzas. It's a great system, too, with clear map displays, smooth scrolling, and easy toggling between zoom level, split-screen views, and live traffic. The system features traffic warnings, and even an automatic-rerouting box that you can check. For all the features it has, the 2014 Kia Cadenza does a good job in offering hard buttons for most tasks, without overwhelming you with them. Climate functions don't depend on the screen system, for instance. What we're not quite as charmed about as we expected is the 550-watt, 12-speaker Infinity sound system, which, when we cranked up the volume even just above midway, sounded a bit distorted (with the EQ zeroed). The Cadenza also features the new UVO eServices suite, which provides a set of smartphone-based services, all accessed through a free app rather than a monthly subscription fee. The service includes a diagnostics assistant, parking minder, roadside assistance, and access to custom vehicle settings. If you're looking for a car that's going to keep your fuel budget especially low, that's the one area where the 2014 Kia Cadenza isn't such a deal. For its size, the 2014 Kia Azera isn't a particularly fuel-efficient vehicle; it's surpassed by powertrains like the EcoBoost four in the Ford Taurus (22/32 mpg), as well as the hybrid powertrain that delivers 40 mpg Combined in the Toyota Avalon Hybrid. It's also worth noting that the Hyundai Azera, curiously, gets 20/29 mpg ratings with essentially the same engine and transmission. In a 140-mile drive of the Cadenza we saw about 21 mpg, with no passengers aboard, and about two thirds of that on the highway and on rural two-laners; that's within a mpg of what we've observed in the Azera. 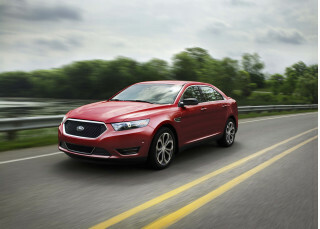 The Cadenza's fuel economy ratings are just 19 mpg city, 28 highway. But, as Kia notes, the V-6 in the Cadenza is designed to run on regular unleaded gasoline. Looking for a different year of the Kia Cadenza?